The Friends of Burma organization is already at work funneling aid to organizations that already exist withing Burma (Myanmar). FOB has partnered with the Burmese over the past 20+ years since God impressed upon Neil and Diana Sowards to come to their aid. Neil’s mom and dad were missionaries to Burma for many years and were forced to leave the country in the early 60’s after the military took over. 100% of every dollar given to FOB goes toward humanitarian and Christian causes in Burma. All administrative work done in the United States is by volunteers. The front part of our church (the pulpit part of Pwo Karen Baptist Ch.) was totally destroyed and the five big stands were cracked. Some church members who live in our church compound are now living in Pwo Karen Theological Seminary classrooms because all their houses’ roofs and walls were lost. 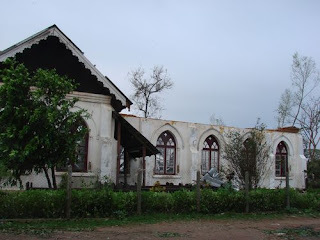 The worst thing is that the church near by our church, Sanchaung Sgaw Karen Baptist Church was totally destroyed. Now the church members are also living in their seminary classroom. Our working place, Myanmar Institute of Theology was also affected by cyclone. The fourth floor of our seminary was totally devastated. Our computer lab was also damaged. Some of the staff houses were also tear-down. My wife Tin Tin got ph. Contact with her family. Her father got accident on his nose and arm by broken glasses. He is now under-treatment. He had to take 16 stitches on his nose and 10 on his arm. He is now getting better. I still do not get ph. contact with my family. I do not know where my mother is, but I hope she will be doing fine. My former organization World Vision is serving among the victims. My friends informed me that one of my brothers’ house was collapsed. All goods prices are increased and people are facing difficulties with their daily food. They guess electricity will be unavailable for nearly three months. If there is no electricity, there will be shortage of water supply. There will be many consequences of this disaster: health problem, sanitation, insufficient food, etc. 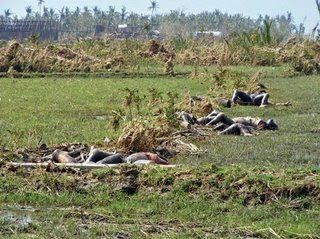 1) Two Pwo Kayin Seminarians were killed. 2) Most of Pwo Kayin Theological Seminary students’ parents and family members were killed. 3) 9 Pwo Karen Churches and more than 35 Pwo Kayin villages were disappeared. They guess there will be more than 3000 PK church members were killed. We, the members our Pwo Kayin Baptist Conference (PKBC) are living in delta area. In PKBC, we have 6 associations. All these associations are in delta area and all were affected by cyclone. Dr. Soe Thiha (Andover NTS), Rev. Dr. Maung Maung Htwe (ANTS), and Ko Ko Lay (PTS) alumni are leading in relief camps. Now PKBC provide a relief camp in Pathein, the capital of Irrawaddy division. Tomorrow, my youth pastor and youth will go to Pathein for relief. Pathein is nearly 200 miles far from Yangon. You can donate online, or you can send your donation to Friends of Burma @ 548 Home Ave Ft Wayne, IN 46807. We are a 501(c) organization, so all donations are tax deductible. If you can’t give, please pray to that God will turn the hearts of the military regime to allow humanitarian aide into the country. The world can not sit by and allow these people to keep on suffering and perishing because no one will help.